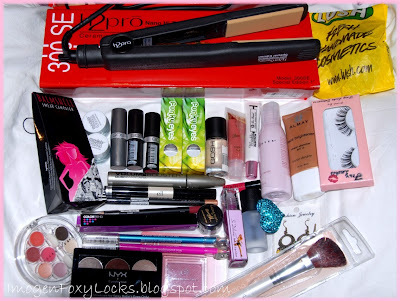 Imogen Foxy Locks: Youtube Competition ~ Design Foxy Locks Extensions Storage Case! Youtube Competition ~ Design Foxy Locks Extensions Storage Case! I had so many question about storing extensions and i going to be offering one on Foxy Locks. I thought the best way to see what people wanted was to see their designs, so i came up with this competition! All you need to do is design a storage case for Foxy Locks extensions, it can be soft or hard, preferably not too big, needs to be able to hold clip in hair extensions securely. Please email me with your address details at imogenfoxylocks@hotmail.com. can I be with even though I live in sweden? i cannot wait.....im so excited...i got sum cool ideas!!! yay!!!!! Thanks Imogen for having this contest. I loved making my case it was so much fun. voin kanssa, vaikka asun Suomessa ?????? This is a wonderful competition.I had alot of fun making my case and giving you my ideas. how/where do i enter my design?